Here you will find the books and e-books I publish in English. One of the first ones to be published will be “Towards a new paradigm”. 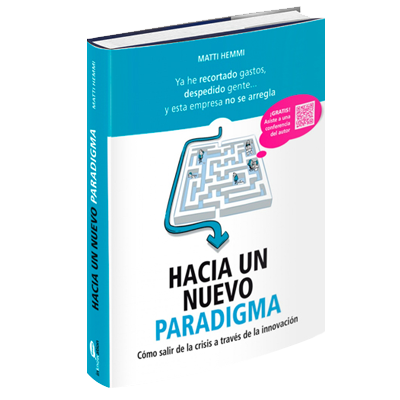 This book was published in Spanish by inKNOWation Dreams in July 2013, under the title “Hacia un nuevo paradigma”. This book describes how you can transform your organization through a structured process, following the steps of the methodology we use at inKNOWation. At the time this text is written we are looking for publishers interested in the rights in English. I am also pleased to announce my second book in Spanish “¿Te atreves a soñar?” (“Do you dare to dream?”) will be published at the end of October. And as for the first one, we are also looking for publishers interested in the rights in English. And my third book in Spanish will be published during the first half of 2014. It should had really been the first one, as I finished writing it in 2010. But at that moment I felt it was not the time to launch it.